Celebration of the anniversary of the birth of Our Lord. In the earliest days of the Church there was no such feast; the Saviour's birth was commemorated with the Epiphany by the Greek and other Eastern Churches. First mention of the feast, then kept on 20 May, was made by Clement of Alexandria c.200. The Latin Church began c.300 to observe it on 25 December, though there is no certainty that Our Lord was born on that day. Priests have the privilege of saying three Masses, at midnight, daybreak, and morning. This was originally reserved to the pope alone; beginning about the 4th century he celebrated a midnight Mass in the Lateran Basilica (in which according to tradition, the manger of Bethlehem is preserved), a second in the church of Saint Anastasia, whose feast comes on 25 December, and a third at the Vatican Basilica. Many peculiar customs of the day are the outcome of the pagan celebrations of the January calends. The Christmas tree, of which the first known mention was made in 1605 at Strasbourg, was introduced into France and England in 1840. The feast is a holy day of obligation, preceded by the preparatory season of Advent and by a special vigil; should it fall on a Friday it abrogates the law of abstinence. Italian noble from the Benedetti family of Todi. Successful lawyer at Bologna, Italy. Married to Vanna di Guidone in 1267; she considered Jacomo too worldly, and did penance for him. In 1268, Jacomo insisted she attend a public tournament against her wishes; the stands in which she sat collapsed, and Vanna was killed. The shock of this event, and his discovery of her penance for him, caused a radical change in Jacomo. He gave his possessions to the poor, dressed in rags, and became a Franciscan tertiary. His former associates called him Jacopone - Crazy Jim; he embraced the name. After ten years of this penance and abuse, Jacomo tried to join the Franciscans; his reputation as Crazy Jim preceeded him, and he was refused. To prove his sanity and intentions, he wrote a beautiful poem about the vanities of the world; it swayed the Franciscans, and he joined the Order in 1278. He refused to be ordained, and spent time writing popular hymns in the vernacular. Jacopone suddenly found himself a leader in a disturbing religious movement among the Franciscans. The Spirituals, as they were called, wanted a return to the strict poverty of Francis. They had the support of two cardinals and Pope Celestine V. The two cardinals, however, opposed Celestine's successor, Boniface VIII, and due to the wrangling in the Vatican, Jacopone was excommunicated and imprisoned at age 68. Jacopone acknowledged his error, but was not released until Blessed Benedict XI became pope five years later. Jacopone accepted his imprisonment as penance. He spent his last three years giving himself to completely to spirituality, weeping "because Love is not loved," and writing, including the famous Latin hymn, Stabat Mater. Born to the German nobility, the eldest of five daughters of Baron Theodor von Wüllenweber. 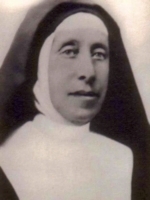 Always deeply religious, as a girl Maria-Therese felt drawn to religious life, and wanted to become a missionary. Educated by tutors and the Benedictines of Liege, Belgium. At age 24 she entered the convent of the Sacred Heart, Blumenthal, Germany. Held positions of authority in convents in Warendort, Germany and Orleans, France. Coming to understand that her vocation was not as a teacher, she left religious life in March 1863, and returned home to her family. She developed a devotion to the Sacred Heart, and was briefly involved with the Sisters of the Visitation, but it wasn't until 1868 that she became a member of the Congregation of Perpetual Adoration in Brussels, Belgium and began working with the poor. She began leading such work in Germany, but it was duing the anti-Catholic kulturkampf era, and in 1870 she returned to her family home. Co-founded the Sisters of the Divine Savior (Salvatorian Sisters) on 8 December 1888, and served as their first superior. The Sisters continue their good work today in 27 countries. Born to the French nobility. Grew up a pious youth. His father died when Peter was fifteen, and he inherited a substantial fortune. When he came of age, he gave away his possessions and moved to Barcelona, Spain to avoid the Albigensian heretics. He later took part in the Crusades against the Albigensians in southern France. Tutor to King James I of Aragon. Settled in Barcelona. Friend of Saint Raymond Penyafort. He used his large inheritance to ransom Christians held prisoner by the Moors. Founded the Order of Our Lady of Mercy (Mercedarians) beginning in 1218, an order devoted to ransoming Christians; the Order received papal approval in 1230. Peter twice served as a captive in Africa, winning the release of over 400 captives. In 1249, Peter retired from the Order to spend his remaining days in quiet prayer. Born to the French nobility. Benedictine monk at Cluny Abbey, and at several sister houses. Abbot of Cluny in 1122. Instituted a number of reforms to the educational and financial areas of the houses; his emphasis on the education of his monks put him into some conflict with Saint Bernard of Clairvaux who felt it detracted from the emphasis on prayer. Peter travelled to England, Spain and Rome, Italy in service to the Order, retiring between trips to live as a hermit. He recommended that the Koran be translated to Latin so missionaries would better understand what they were up against when they evangelized Muslims. Wrote poems, sermons, scriptural studies and treatises against heresy. Daughter of Saint Fausta of Sirmium. Matron of a noble Roman family. Married to a pagan. Spiritual student of Saint Chrysogonus. Martyred in the persecutions of Diocletian. Her name is commemorated in the second Mass of Christmas and the first eucharistic prayer. Nothing is really known about her except her death, but there have been no end of attempts by story-tellers to fill in the blanks. One of Saint Francis of Assisi's earliest disciples and one of first Franciscans. Priest. Noted preachers, miracle worker, healer and visionary. Professional minstrel. Benedictine Cistercian monk at Thoronet, France. Abbot in 1200. Bishop of Toulouse, France in 1206. 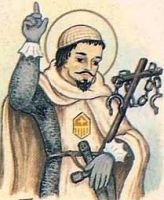 Helped Saint Dominic de Guzman found the Order of Preachers by providing him a base of operations, books, equipment, and one-sixth of the church tithes. Princess, the half-sister of King Egbert of Wessex. Wife of Earl Wulstan of Wiltshire who founded Wilton Abbey near Salisbury, England in 773. Widowed in 800. She converted Wilton Abbey into a convent for women, retired there with a dozen fellow Benedictine nuns, and is also considered a founder of the house. Daughter of Saint Adalbald of Ostrevant and Saint Rictrudis of Marchiennes. Sister of Saint Eusebia of Hamay, Saint Clotsind and Saint Mauront. Benedictine nun at Hamay-les-Marchiennes near Arras, France and spiritual student of her sister. Jesuit. Martyred for hiding and assisting priests and missionaries. Canon of Rheims, France. Benedictine Cluniac monk at Saint-Martin-des-Champs in 1108. Prior of his house in 1117. Created cardinal bishop of Albano in 1125. Papal legate in France and Germany in 1128. Staunch supported of the Cluniac ideal. Close friend of Blessed Peter the Venerable. Mercedarian friar at the convent of Santa Maria Guardia in Prats, Spain (in modern Andorra). Helped ransom a total of 132 Christians enslaved by Moors in Granada, Spain. Soldier. Knight. Lay member of the Mercedarians. Ransomed at least 150 Christian prisoners from slavery in Africa. Known for his personal piety. Priest. Founded a monastery in Berry, France. Dominican tertiary. Cared for the sick in Siena, Italy. 20,000 Christians martyred by order of Diocletian. They were reported to have all been in the single basilica to celebrate Christmas. While there unquestionably was an endless series of martyrs under Diocletian, it's likely the ancient sources exaggerated the numbers of this incident. And as the Christmas holy day was not celebrated in the East in 303, they were probably gathered for another feast.